A Glance at Madagascar: pp. 50-82. Librairie Tout pour l'École (1973). 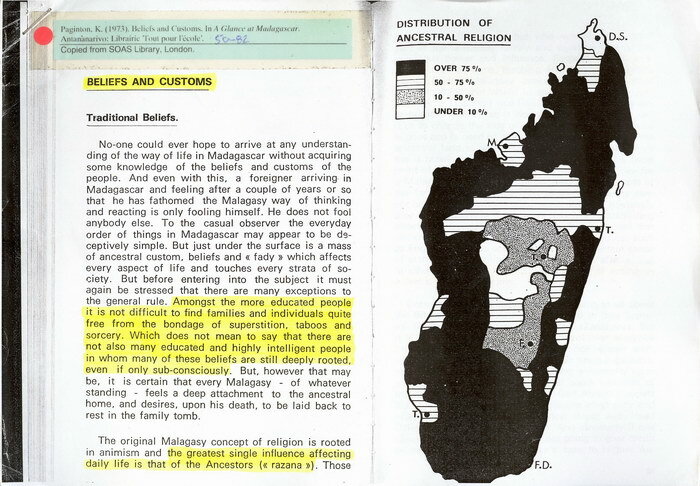 This chapter discuses the distribution of different religions in Madagascar, and numerous cultural elements and concepts including: fady, vintana, tsiny, tody, idols, sorcery, tromba, mpakafo, blood-pact, circumcision, trial by ordeal, fandroana, birth, marriage, death, burial, and famadihana. There are photographs of a zebu sacrifice and a famadihana ceremony, as well as three maps showing the distribution of ancestral religion, protestants, and catholics in Madagascar. A further illustration describes the vintana system as mapped onto the layout of a traditional Malagasy house. Very Good. Text is extensively marked in fluorescent highlighter.